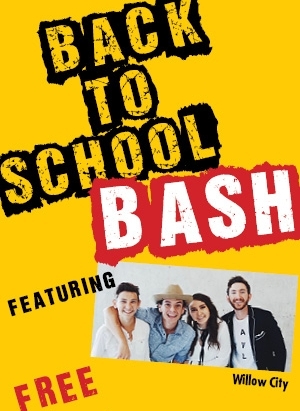 UPDATE: BTS BASH IS ON FOR TONIGHT - TUESDAY 8/14. FORECAST IS CALLING FOR A NICE AFTERNOON AND EVENING WITH TEMPS IN THE MID 80'S. from 5:00 pm until 9:00 pm at The Fountain Stage - hosted by KLAK's Randi Taylor! Enjoy FREE activities for the whole family including facepainting, balloon artists, a petting zoo, bounce houses, and appearances by Moana, Captain America, Peter Pan and Tinkerbell! Enjoy FREE entertainment including a Magic Show - presented by Macy's, a performance by Willow City and FIREWORKS! The first 500 kids 10 and under will receive a FREE Back To School goodie bag. Goodies bags are appropriate for children ages 2 to 10. Children under 2 will receive an age appropriate gift while supplies last. And, Killarney's Live will be on site grilling up burgers and dogs and icing down drinks for purchase - the first 500 kids age 10 and under will get a FREE hotdog courtesy of Killarney's Live! Grab a shaved ice from M6M - all proceeds will benefit Children's Advocacy Center of Collin County. *Lines for characters appearance will start 30 minutes prior to the appearance start time. Please understand that due to the heat character appearances must end on time. If the line becomes too long, we will close it off to ensure that our characters finish their appearance on time. We'll be giving away fun prizes throughout the event and one lucky kiddo will be selected from the audience to come on stage with Willow City and Randi Taylor to lead the fireworks countdown. Be sure to stop by the KLAK Radio booth and enter to win a year lease on a Jeep Wrangler - get details HERE. We will be adding more seating in The Fountain Stage area, but feel free to bring lawn chairs and blankets. For safety reasons, umbrellas, tents and other shade structures are NOT permitted.